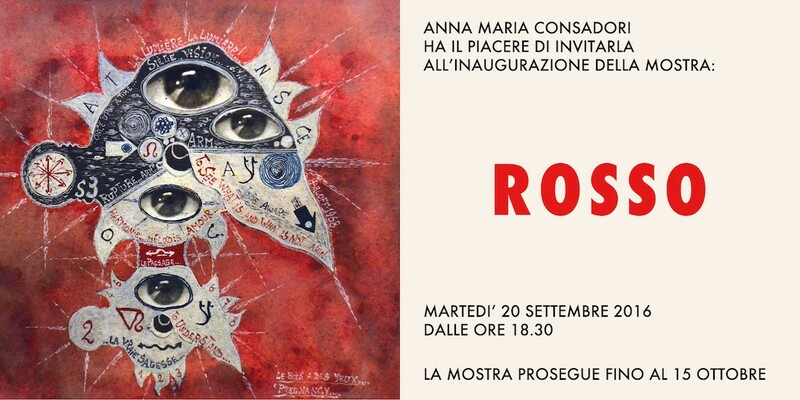 From 20th september to 15th october 2016 the new exhibition entitled “Rosso” (“Red”) is open at Milan-based Consadori Gallery (via Brera, 2). The red color evokes contrasting and strong emotions. Red is the color of fire, of blood, it is the color of the élan vital, of the action, but it is also the color of authority and strength. Red is the color of Christ and of Church, but also the color of red flags of insurrections and of the red-light-districts. It is the color of danger and, at the same time, the color of luck. Red always has a huge impact and it has always been used to furnish houses and buildings, according to trends and historical circumstances. A lot of artists loved and still loves this color, even in his monochrome version. The Pietro Consagra sculpure-table as well as the “Mexana” table by Carlo Scarpa are really interesting exemples of 20th Century red design production. The exhibition at Consadori Gallery, entirely dedicated to red color, also will show some artworks by Paolo Baratella, one of the first “Negative-Positive” by Bruno Munari, Fontana Arte’s lamp design by Max Ingrand, and an important 17th Century “Saint Paul” realized by Orazio De Ferrari. Every artwork and design piece displayed in this exhibition will invite visitors discovering all the shades of red and exploring the potentiality and the intimate beauty of this color.